The Big Sister of the brothers with the cabin bedroom, needed a paint job also. She likes yellow. And stripes. My first thought was this would be the EASY job, especially after the fireplace rocks and wood effect of the logs. I was WRONG! No taping was really involved with the boys room!! I hate taping. 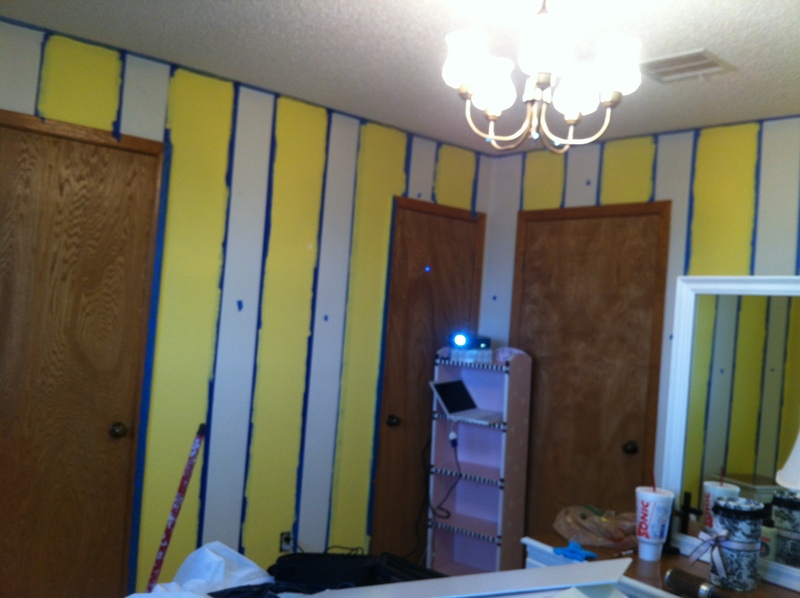 I now know I hate taping vertical measures stripes worstiser. I also found out that stripes are a bit like wallpaper, the measuring and layout need to be planned. Hopefully no one will measure the width of the last stripe. 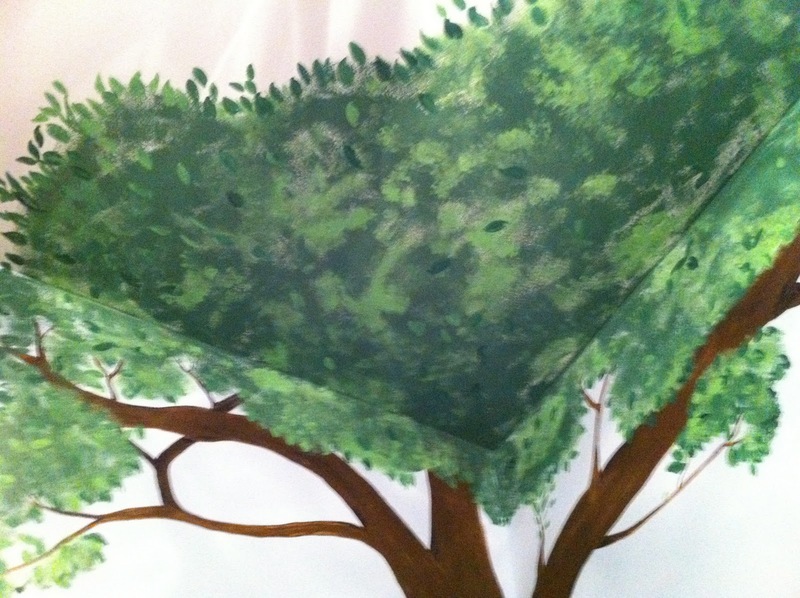 After the stripes we added a tree silhouette . 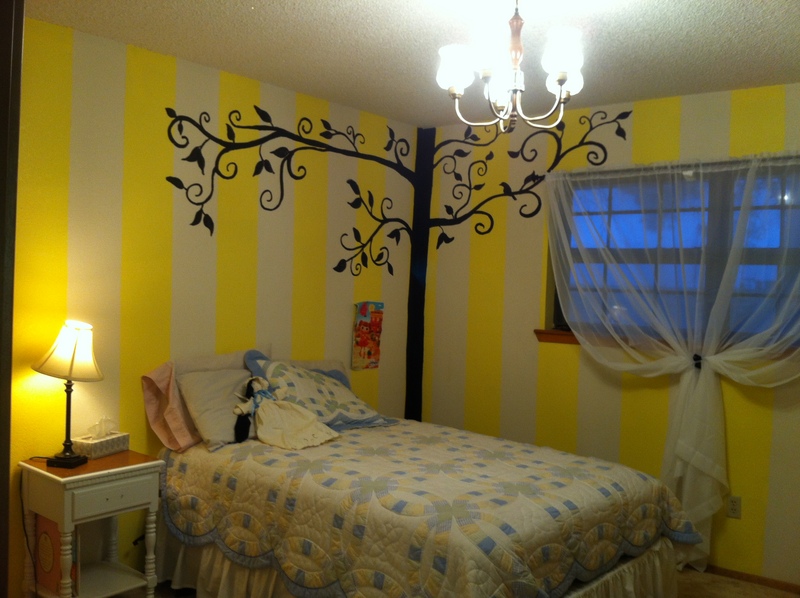 My granddaughter has another bedspread with black and white swirls that really makes this look great! 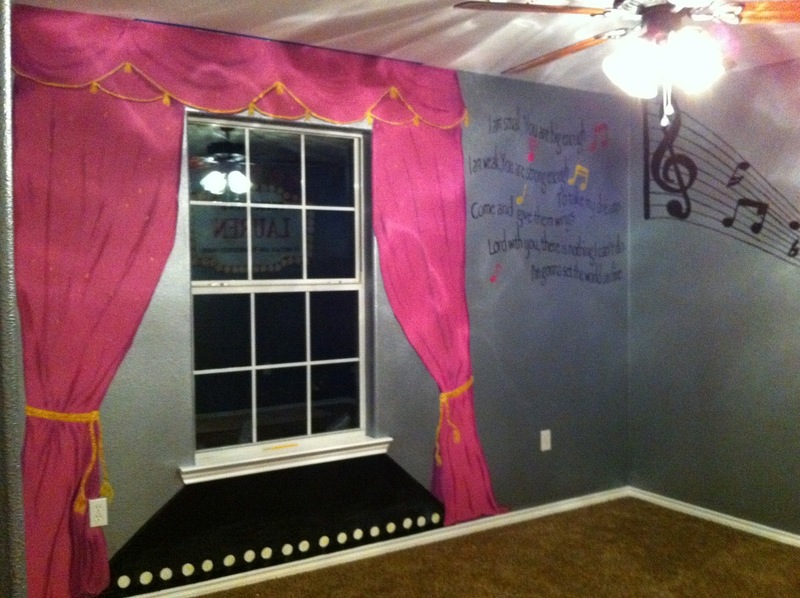 A few months later we added the stage and curtains, for a birthday gift. This has worked as a stage for performances. Also a runway for clothes designs. A great place to stack clutter of course. Recently we talked about adding some wall shelves and pillows for a reading corner. 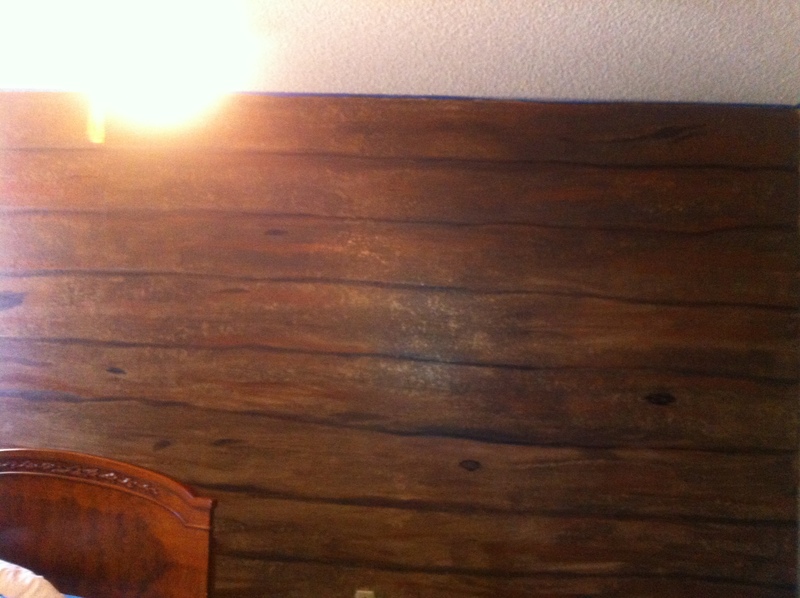 The mother of my Grandsons, the brothers, had a great idea for decorating their room. 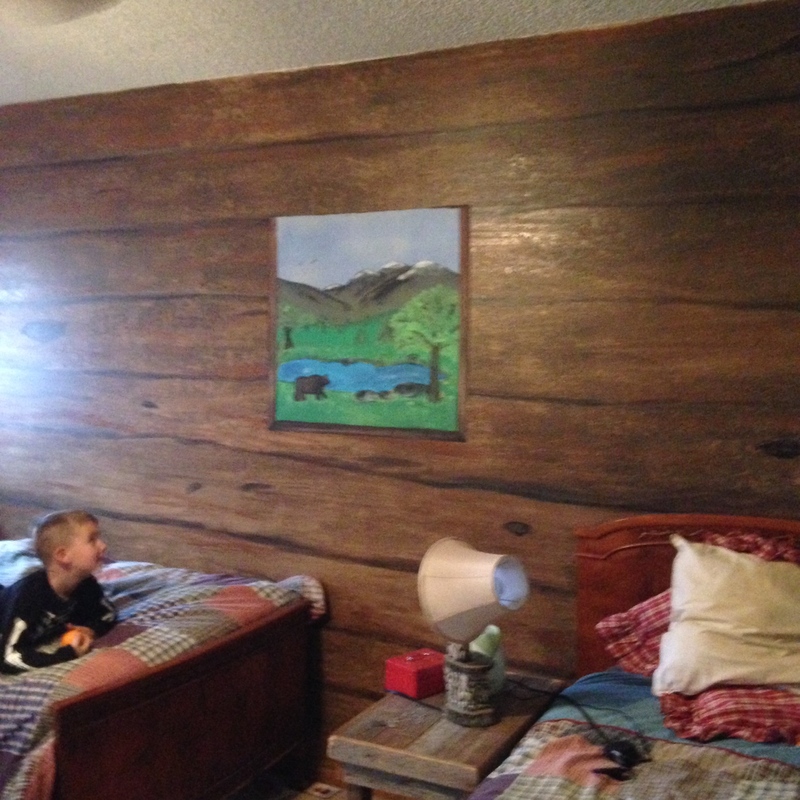 She wants it to look like the inside of a log cabin. 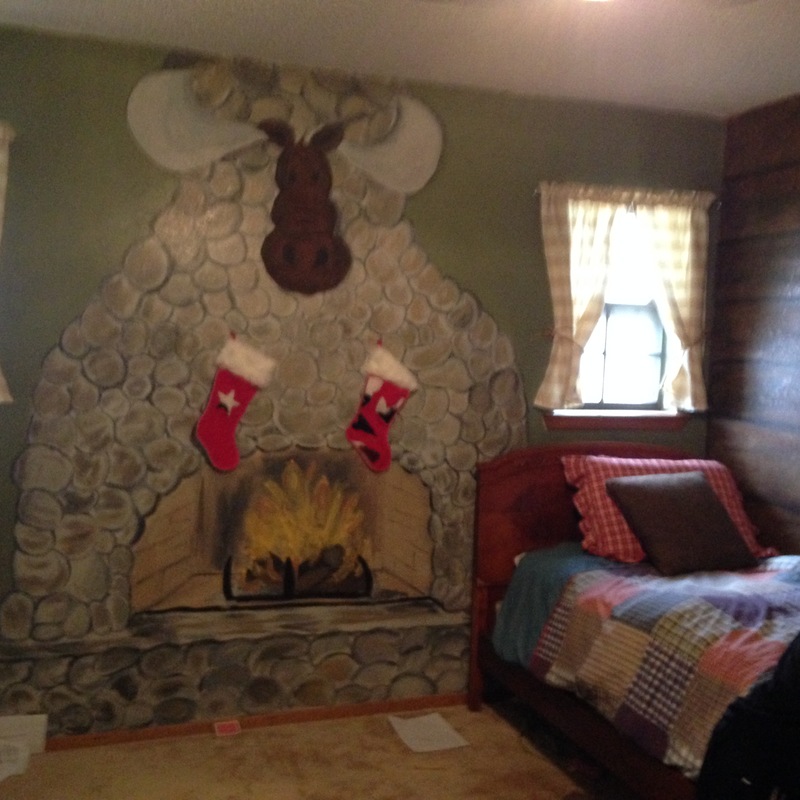 She drew out the look of the fireplace she wanted and then asked ,ever so politely ,if I would do it for the boys. 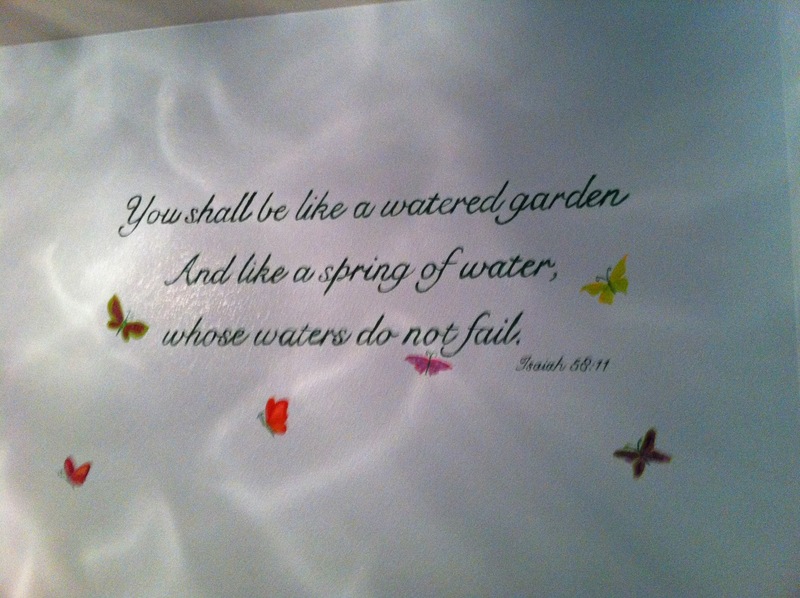 She painted one wall moss green! And I added the fireplace. Then I started the log wall. The job took me a couple of days. All were happy with it. I was pleasantly surprised at how it turned out! I usually am. The stockings go up each Christmas . We are still thinking of hanging a real mantel someday. There was one problem. I forgot the window I was commissioned to paint. I did not even realize it for a few weeks. My daughter in law was too kind to mention it. So over a year later I finally painted the window I do like the window! From a distance the bear does not look like a hairy pig, like it does close up. We are still in search of a faux bear skin rug for the room. Any one know where to get one? 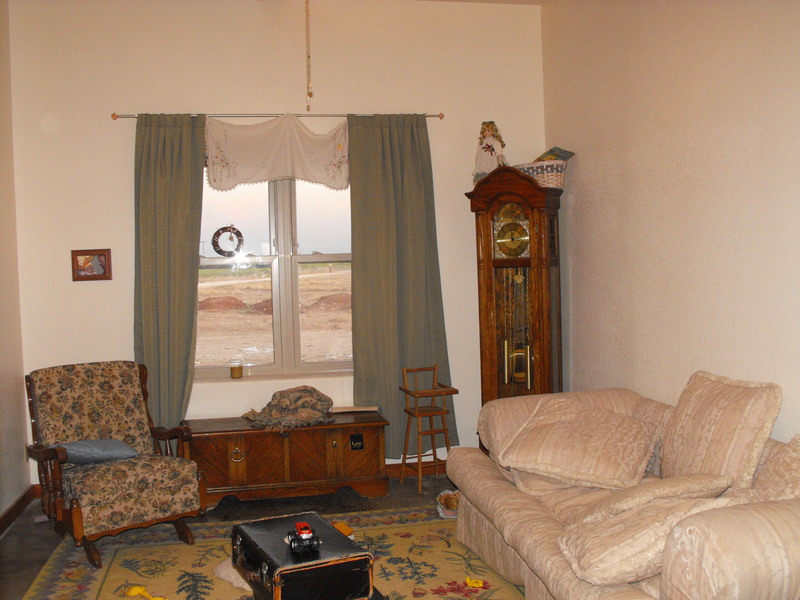 One room in my home is called the ‘Nonnie Room”. 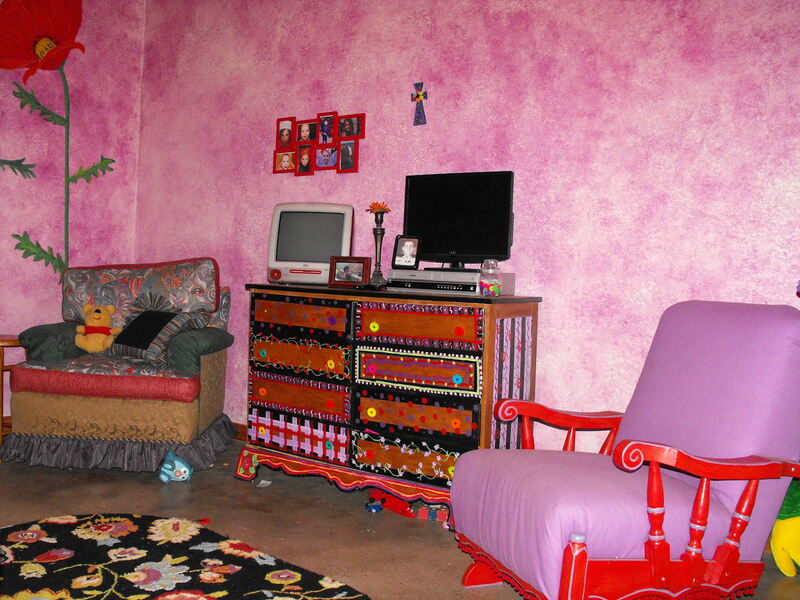 The purpose for this room is ME and my grandkids. 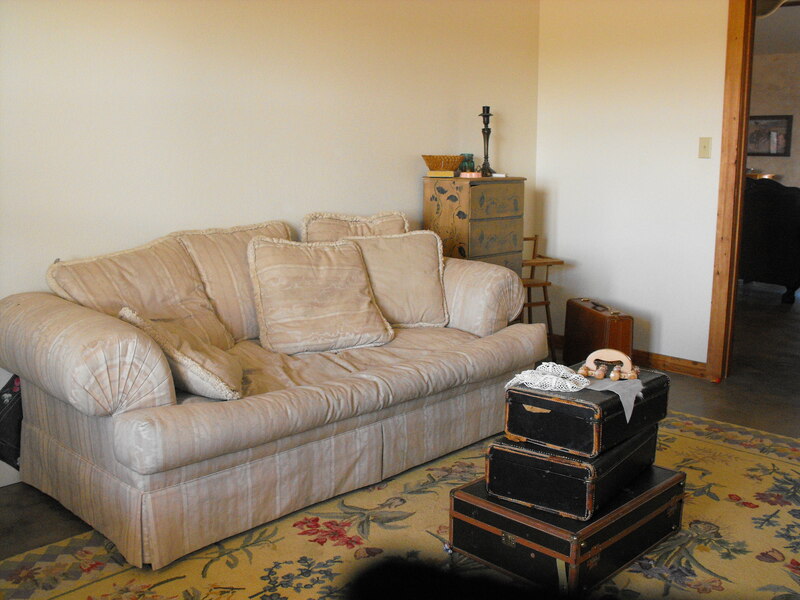 The kids toys, dress ups, books and such are located in the suitcases and in an unpictured cedar chest and dresser. 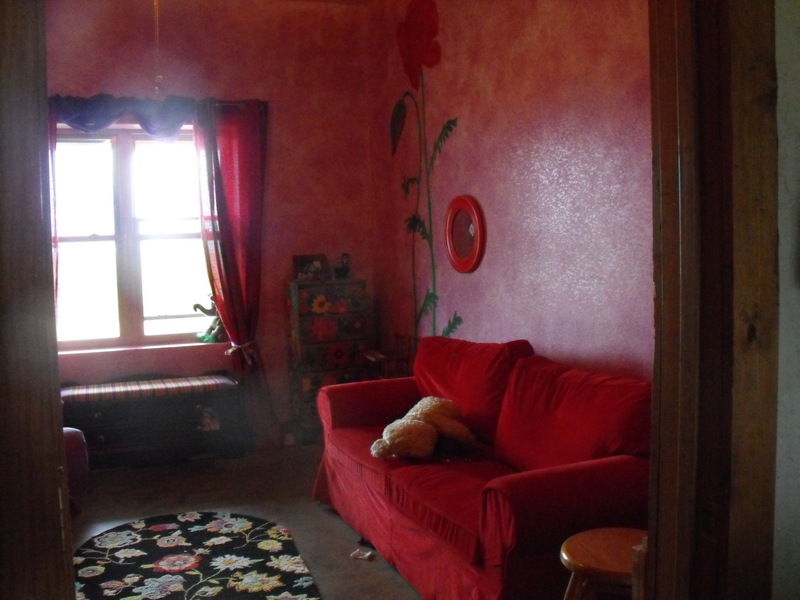 The room WAS cute enough but it just did not reflect NONNIE much. So I put ME into it. 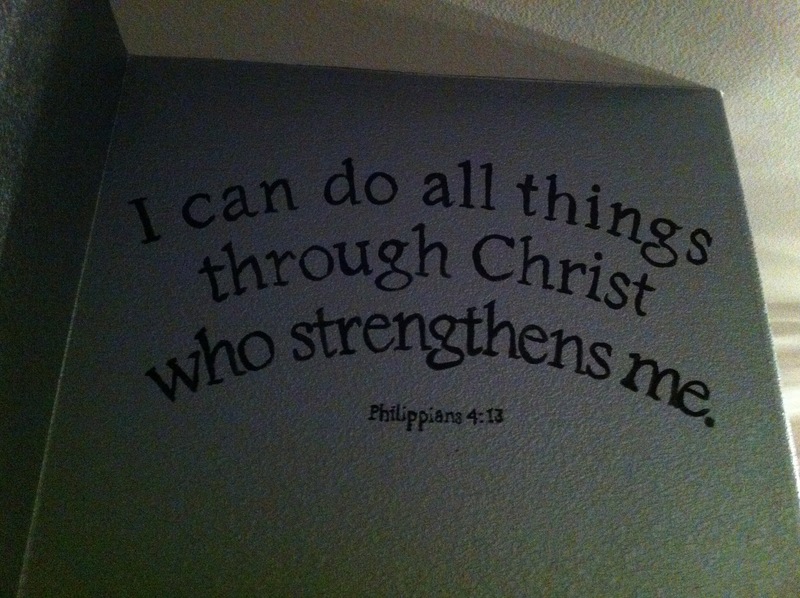 First I painted the walls. I originally wanted PURPLE and then talked myself down to a glazed purple. I am not happy with it. 😦 But after glazing it all, ceiling included, I thought I would learn to love it. I have not. It takes on different colors through out the day. Purple, to fushia, to pink to red. 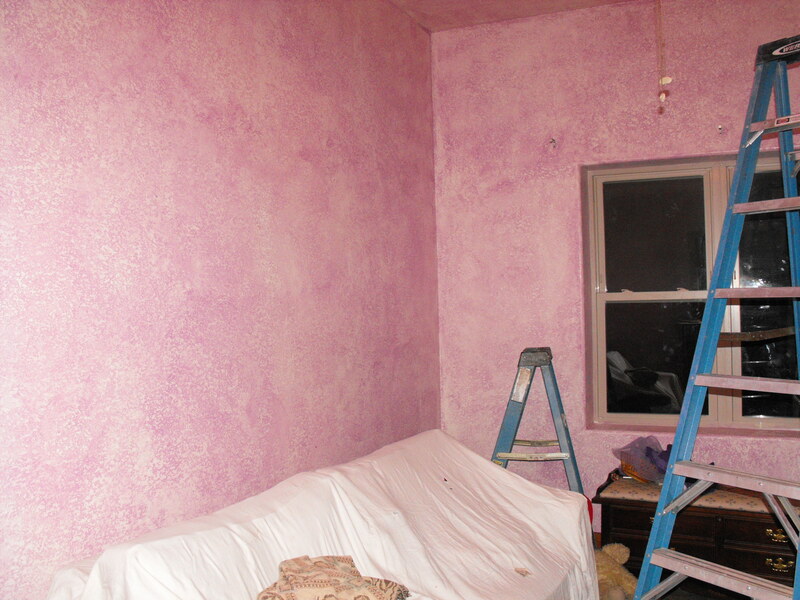 I think I will go back and do a couple of the walls purple someday. I bought the paint. 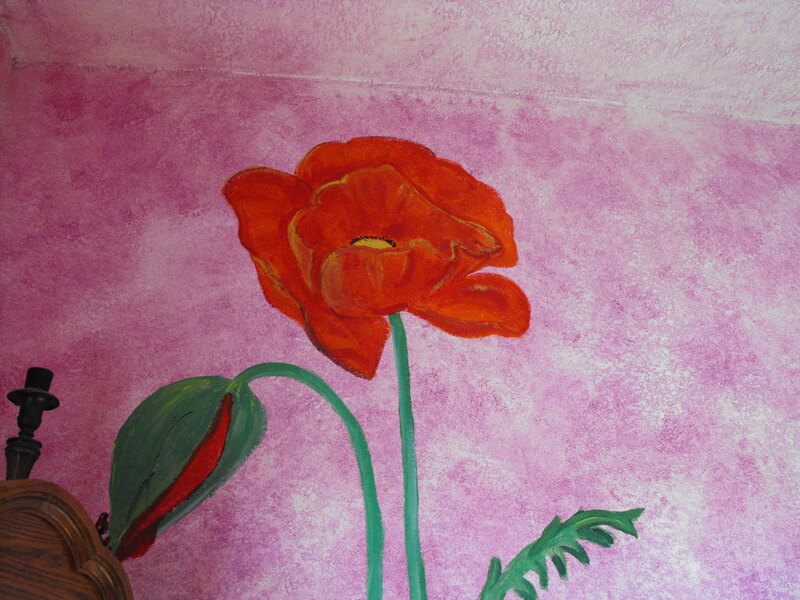 The reason for just a couple of walls going purple is My giant poppies. I don’t know why, but I wanted poppies. Big uns. Ashton, one of my daughter in laws, reworked a room and allowed me to purchase my favorite couch of all time from her, at a GREAT price. 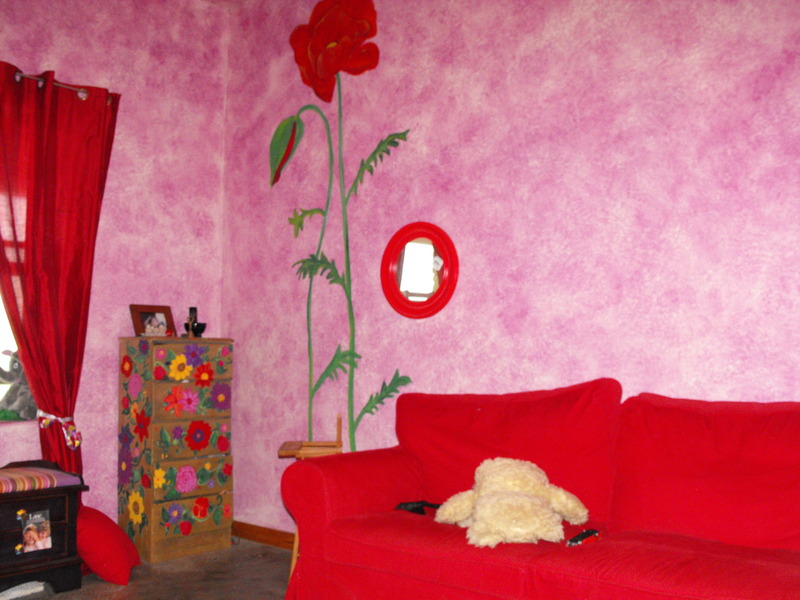 Which really is the need for RED poppies and the purple walls in the first place! 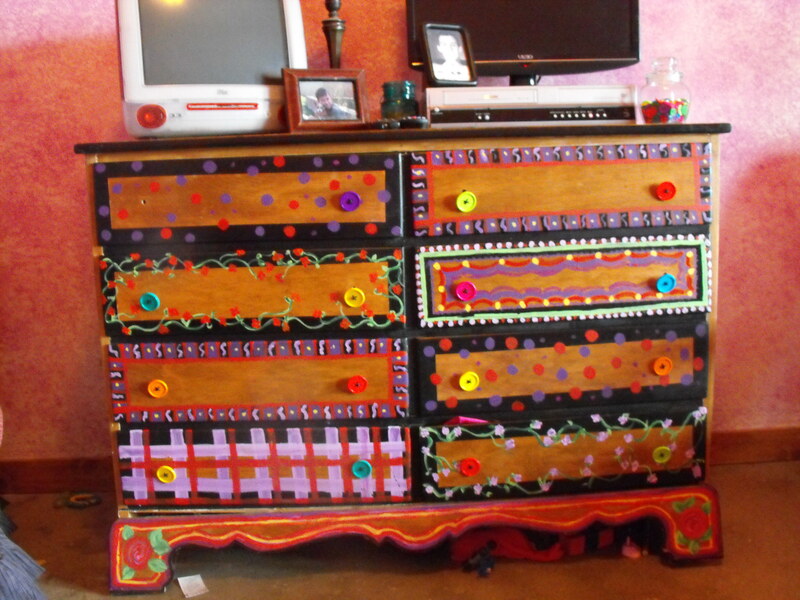 More toy storage needed some work: Mom’s tapestry rocker felt just right but did not look like Nonnie. I fixed that though.I It is still needing something- I will be inspired someday. 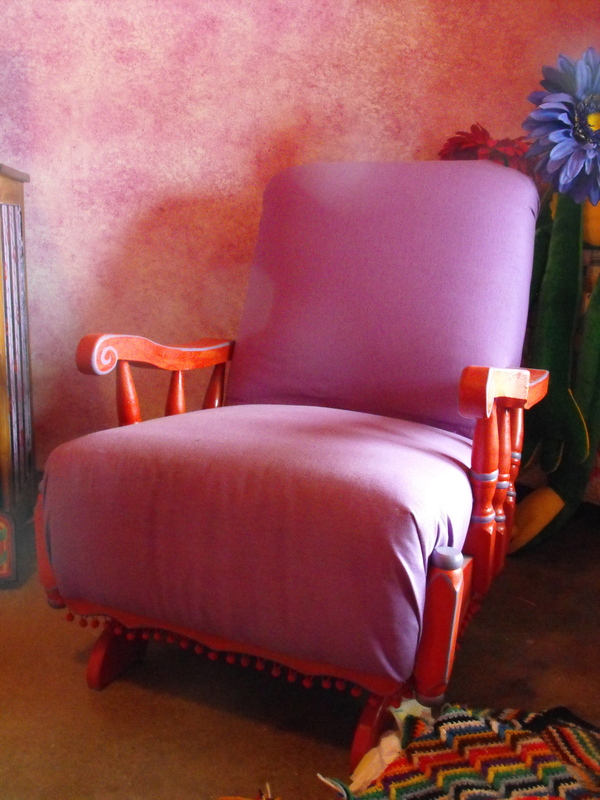 I revamped the cedar chest with a new top , replace rug with the perfect find fromTuesday morning, a purchase of a coveted chair from a friend, and some curtains from Amazon, move a grandfather clock, win a giant frog, buy giant flowers from Hobby Lobby, and….. 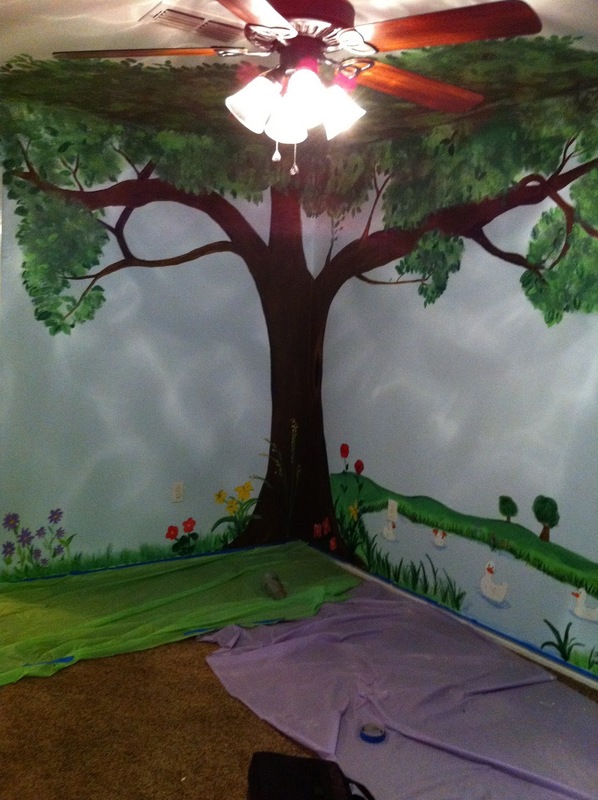 Recently I was hired, given the opportunity, to paint the rooms of a friends daughters rooms. 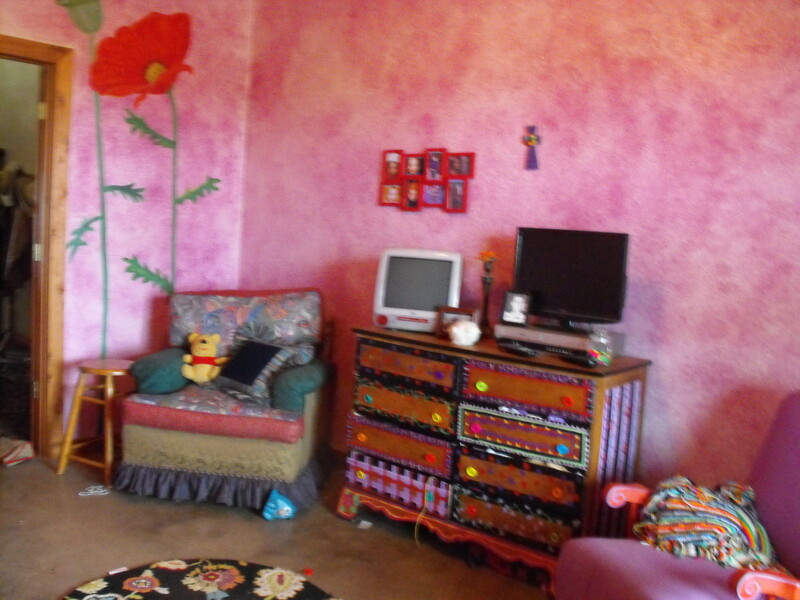 I had painted their rooms in their previous house. And with their next move, I was asked to do again. What an honor! This is Sammies room. We still are hoping for a real honest to goodness swing to hand from the tree. Sammie at first was a bit disappointed because I did not put a pig in the room. She told me just a few days ago though that she loves the room. Maybe I am forgiven. 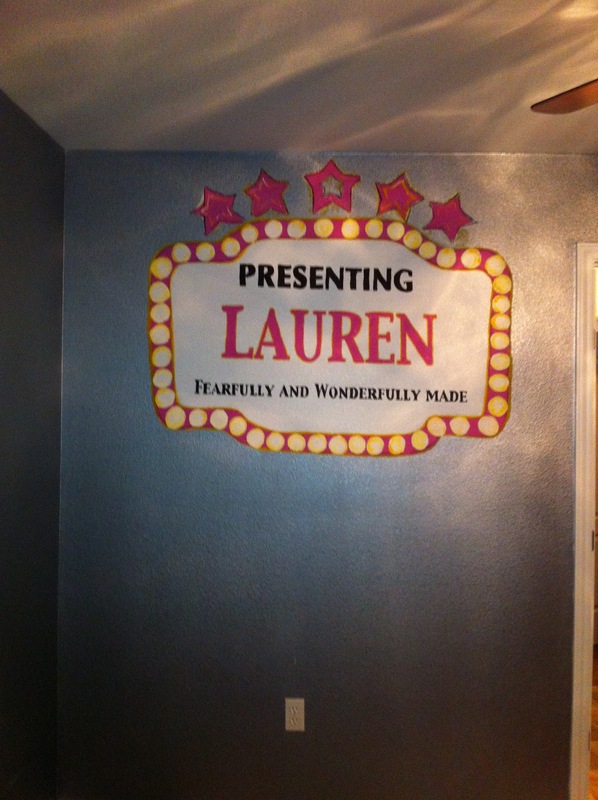 This is Lauren, big sis’s room. 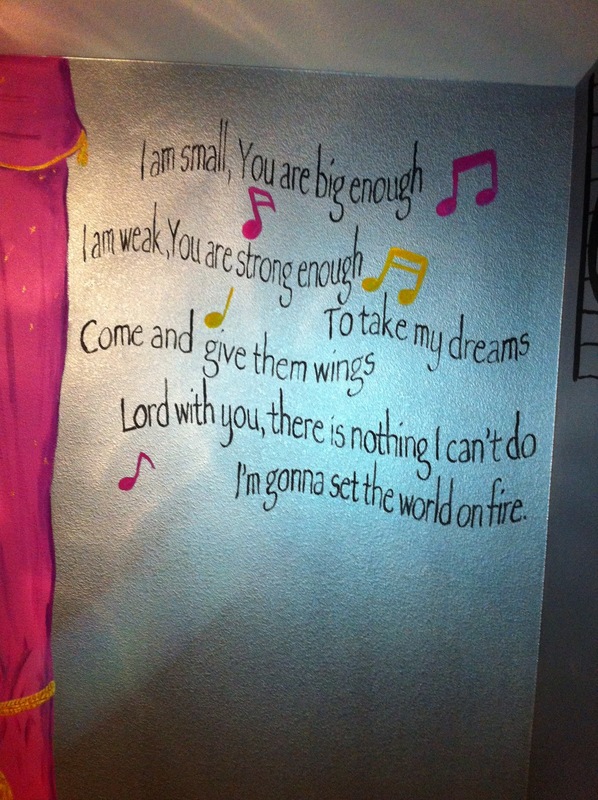 She graduated from a princess room to a High School Musical themeish room. They have some posters they will be framing and putting up. You can not tell from the pictures but the base paint is AWESOME! When talking about it I suggested a greyish back ground, instead they found SILVER shiny SILVER, it is soooo cool! Loved loved loved doing this. I would go in in AM and work till the late evening. The family had not moved in yet, the best way to take over someone’s home. Keith was not the most patient husband for the 40 hrs it took me to do this. 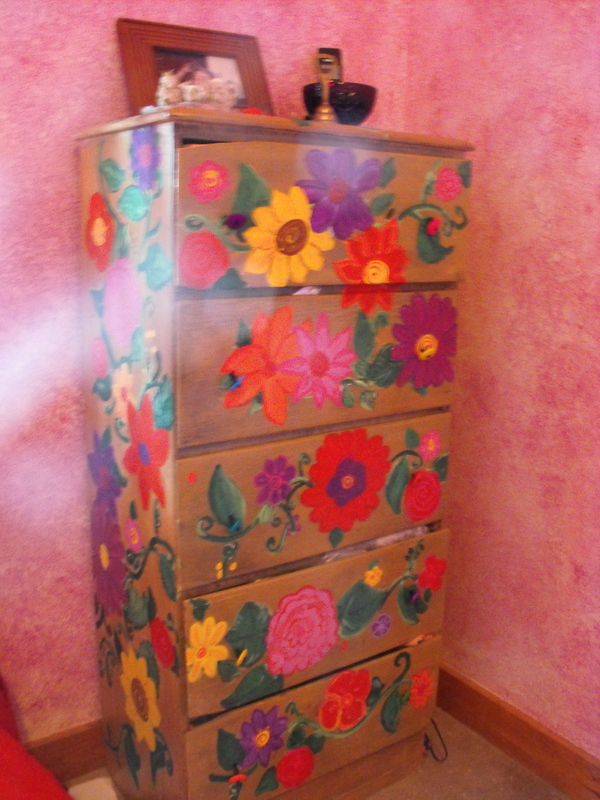 It was not 40 straight, I had a couple of days and weekends that I did not paint, so he ‘got ‘ me then. It was 40 hours, but the time seemed to fly. I wish it was faster, for them and me though. Words take time and the tree leaves, and the rope and the music…. Well I guess it all does.